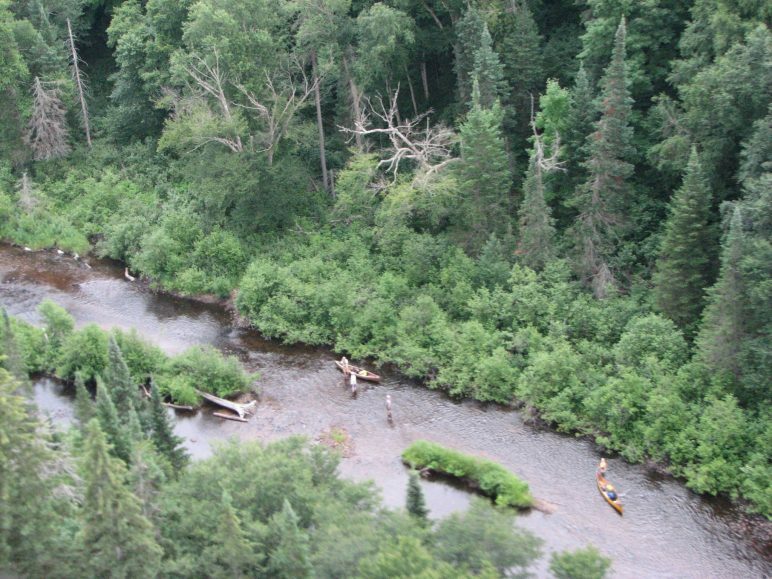 Easily the most unusual canoe route in Algonquin Park and possibly the most challenging. What is the Meanest Link? The Meanest Link is a canoe route created to honour the memory of Bill Swift Sr., one of the founders of Algonquin Outfitters. Swifty, as he was most often called, had other nicknames, such as Mean Dude, or Meanest, which were a tribute to his gruff exterior persona. How he got those names is another story. “The Link” was dreamed up by Alex Hurley and Gordon Baker in the summer of 2004. 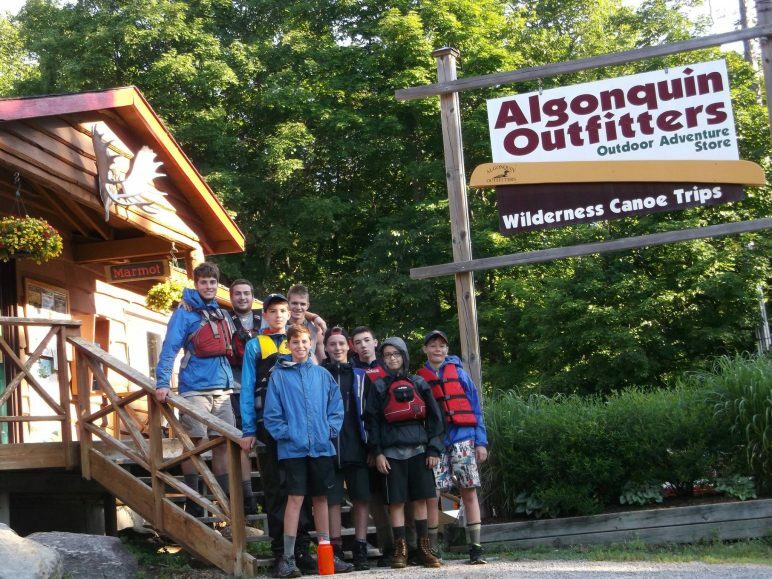 The trip consists of four challenging canoe routes connecting the four Algonquin Outfitters stores serving Algonquin Park: Oxtongue Lake, Huntsville, Brent on Cedar Lake, and Lake Opeongo. 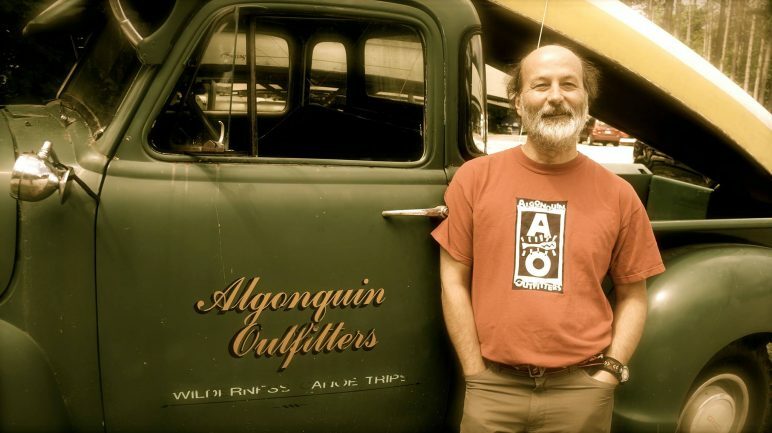 Meanest’s love of canoe tripping and numerous feats of endurance on the trail were legendary, so Gord and Alex felt that a canoe route linking Algonquin Park and Algonquin Outfitters would be an appropriate way to honour him. 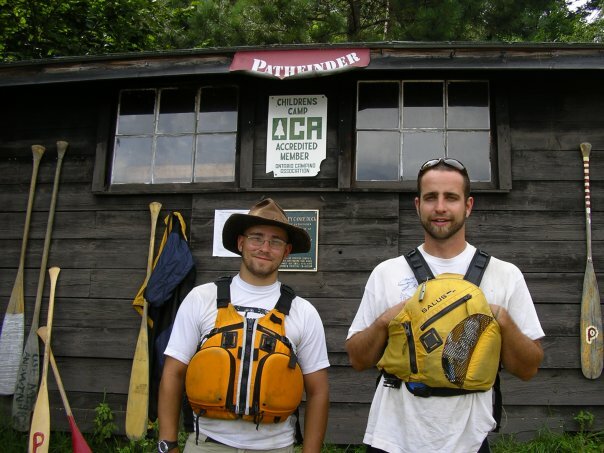 Paddlers must follow a prescribed route between each location and follow a few traditions along the way. 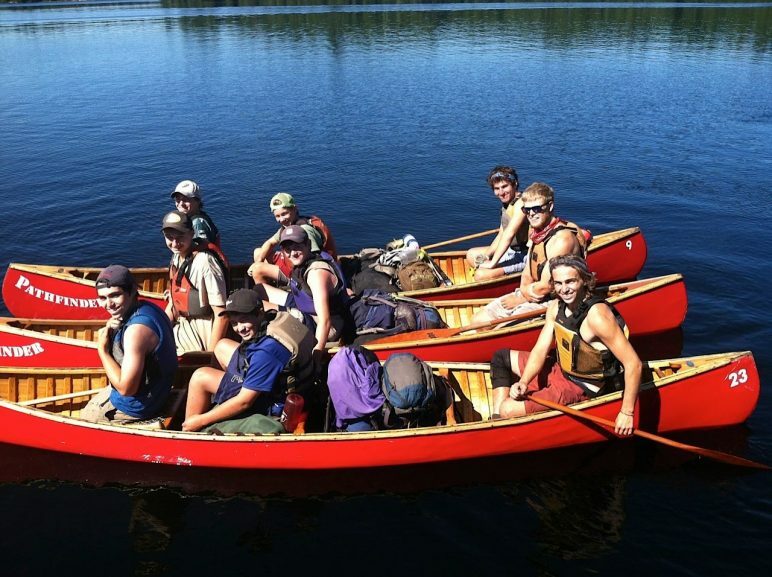 Each leg of the trip must be done as a single canoe trip, with the exception of the Huntsville/Brent leg, which due to the difficulty and time required, may be split into two sections. 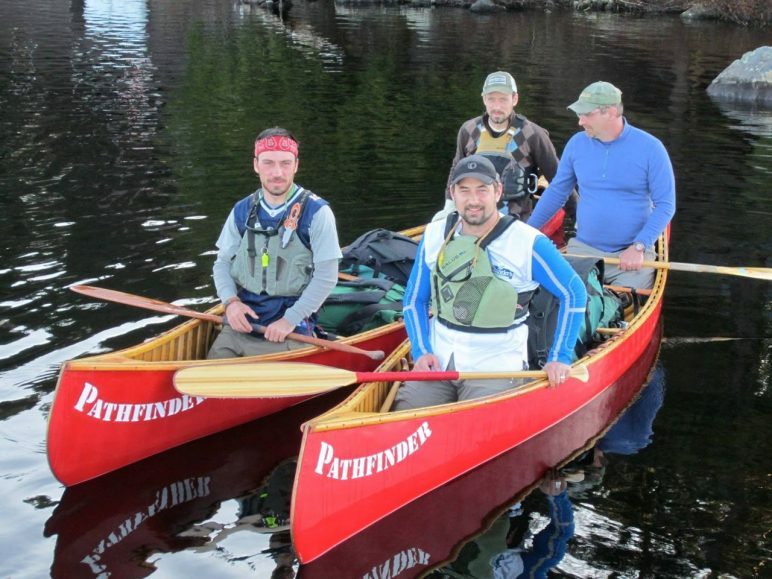 Ambitious paddlers with time on their hands can attempt the “Full Link” and do all four sections on one canoe trip totaling approximately 420km or 261miles . While the “Link” is not intended to be a speed trial, several amazing feats of marathon paddling have been recorded. 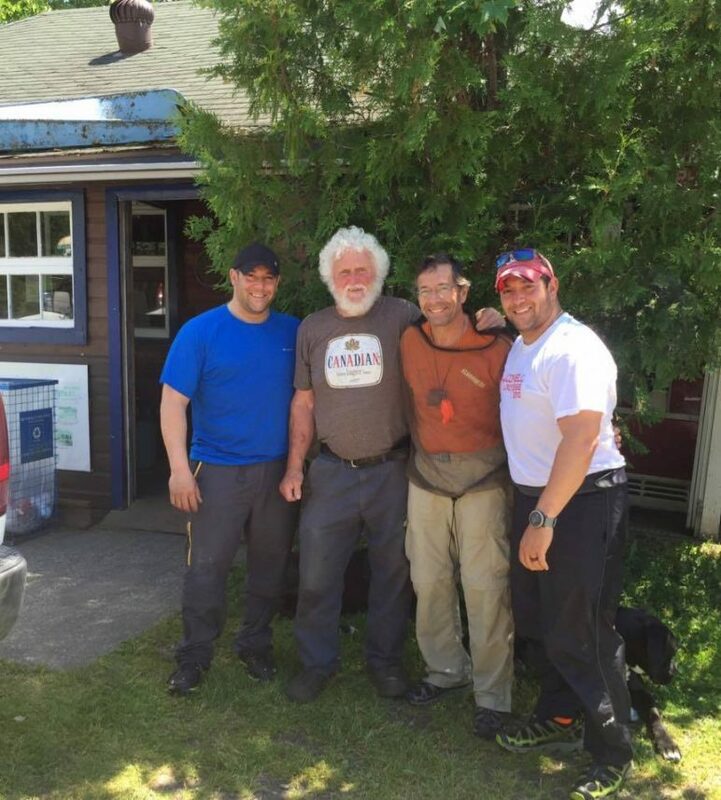 Chris Bosworth and Rob Finkbeiner, for example, left the Brent store at 4 am (in fog and darkness) and landed at our Opeongo store 17 hours later. 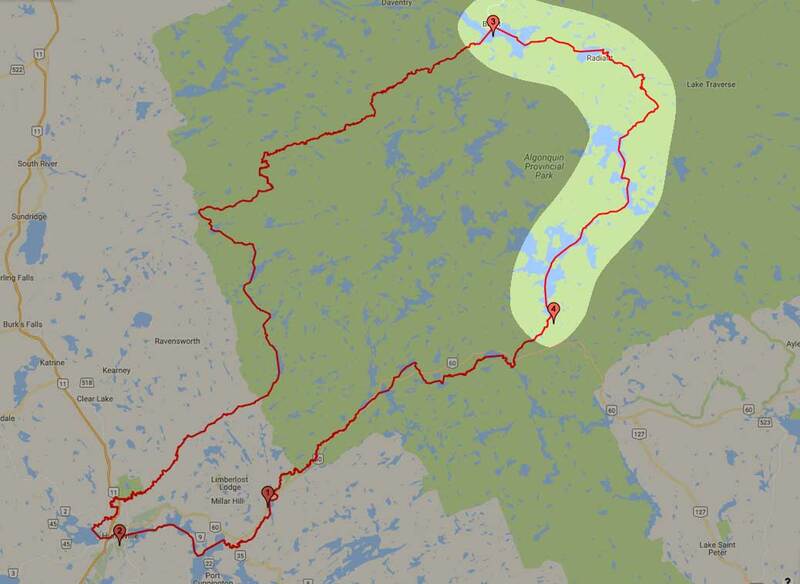 The average canoe tripper would probably take at least four days to do the route down the Petawawa River, up the Crow River to Lake Lavielle, over the famous Dickson-Bonfield portage to Lake Opeongo. 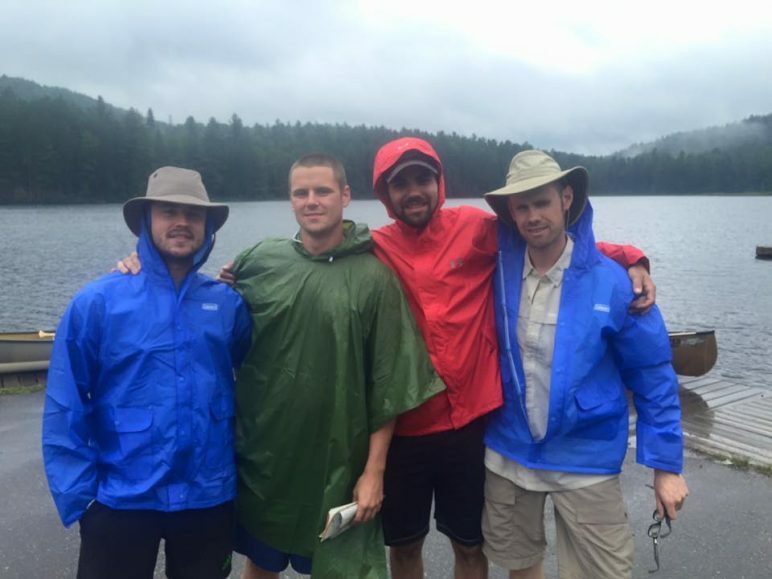 Jon Wilke and Brad Coultes paddled from Opeongo, through Oxtongue Lake to Huntsville in just under 30 hours. 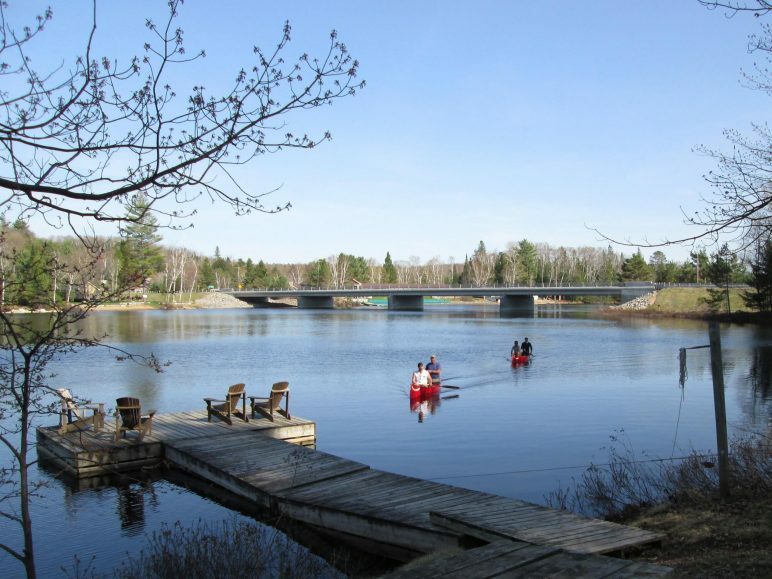 These two sections contain many portages and route-finding challenges, not to mention the mandatory stops at Camp Pathfinder and Oxtongue Lake. On the other side of the coin, several parties have had misadventures along the way, frequently due to underestimating the challenges of the route. These paddlers shall remain nameless. Anyone who attempts the route should be celebrated for trying and, if necessary, having the sense to call it quits. In the fall of 2004, the first attempt at doing the route as a single continuous loop trip was accomplished. Up until then, no one was able to take the time to attempt the Huntsville/Brent leg, let alone the entire route. The Huntsville/Brent leg goes up the Big East River to Algonquin Park’s western boundary, up the boundary via McCraney, Rain, Ralph Bice and Big Bob to the Nipissing River, then down the “Nip” to Cedar Lake and the Brent Store. This is a TOUGH section. Except as a spring whitewater run, the Big East is rarely travelled upstream of the Williamsport Road bridge. Will Lougheed and Randy Pielsticker tried to complete the whole loop in early November 2004 but had to cut their trip short due to bad weather, low water and the fact that they were running out of food. Given the marginal weather, short days, unknown terrain on the Big East River and generally challenging conditions, their accomplishment is significant. 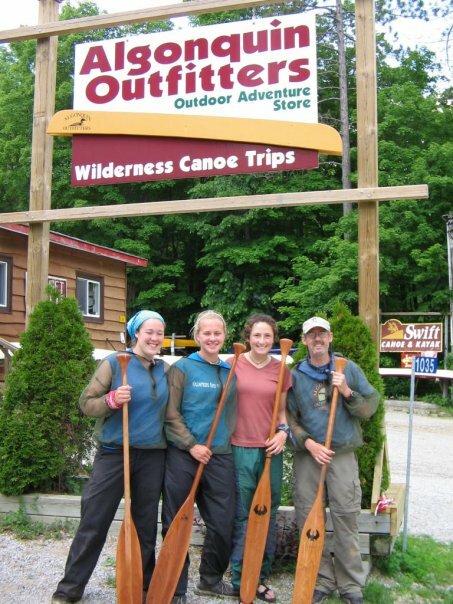 In June of 2005, four determined young women quietly booked time off, planned, packed and started paddling from Oxtongue Lake. 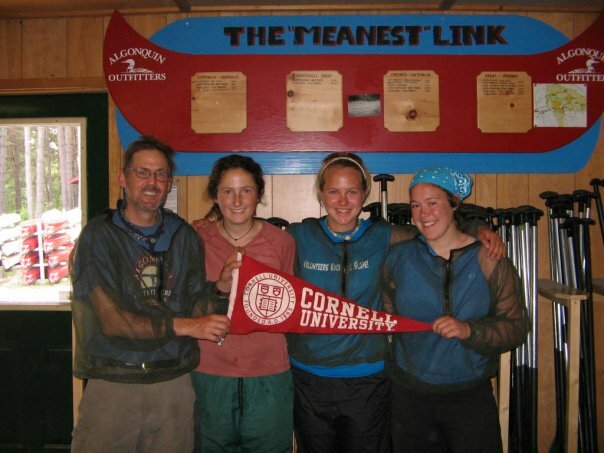 Fifteen days later, Janet Thomas, Jaime Capell, Sarah Strickland and Leah Sanders became the first party to complete the “Full Link” as a continuous canoe trip. Their timing was chosen to give them ideal water levels, at the cost of travelling in the peak of black fly season. For the full story of the Meanest Link and a detailed account of their trip, as written by Huntsville writer Don McCormick, please start at “Meanest Link, part one” on our blog and go from there. 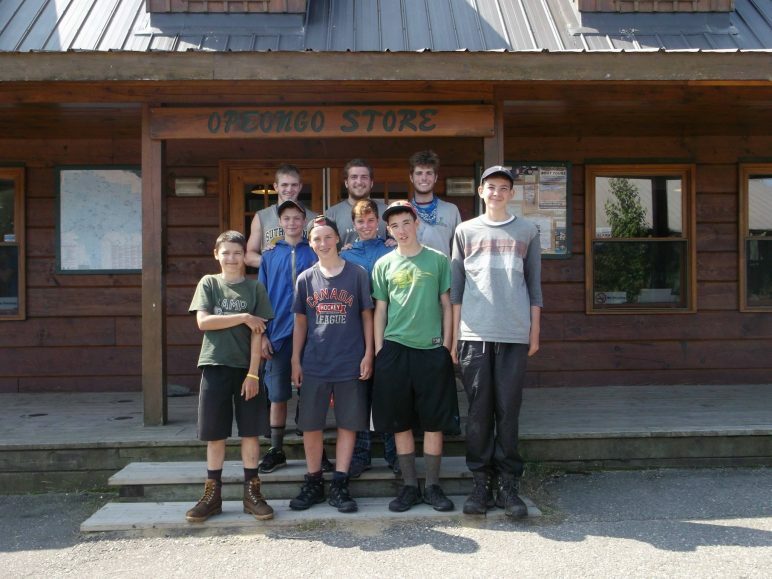 Since then, many staff members have done sections of the Meanest Link, more “Full Links” have been completed, and, best of all, participation in the Meanest Link has extended beyond Algonquin Outfitters staff to include customers, friends and “Full Link” groups from Camp Pathfinder. In June of 2008, Will Lougheed and Chris Bosworth set out to become the second group to complete the full link. Leaving early June, Will and Chris were giving themselves 14 days, and 2 food drops to complete the trip. A family friend Clarke Wallace passed the day before the trip. 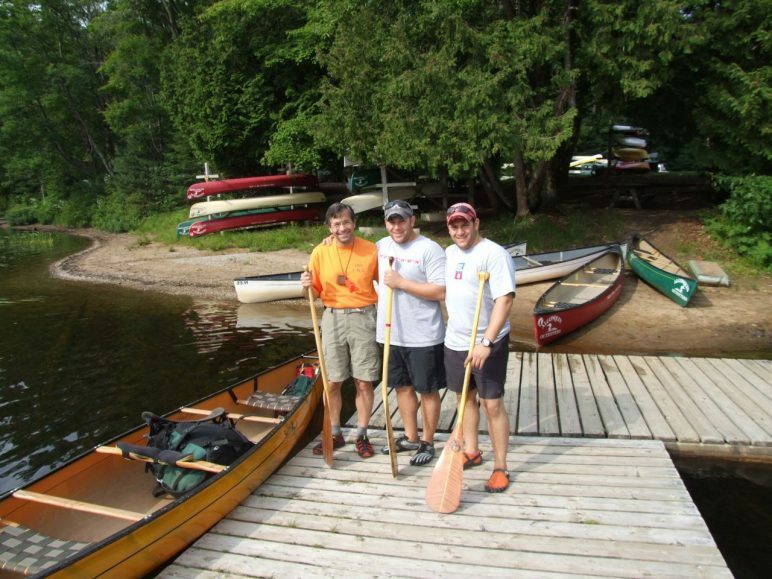 The carbon Mattawa being used was named C.W 1 in memory of Clarke and the trip dedicated to him. With Clarke looking over, the waters stayed calm, the weather clear and the trip was looking very positive. 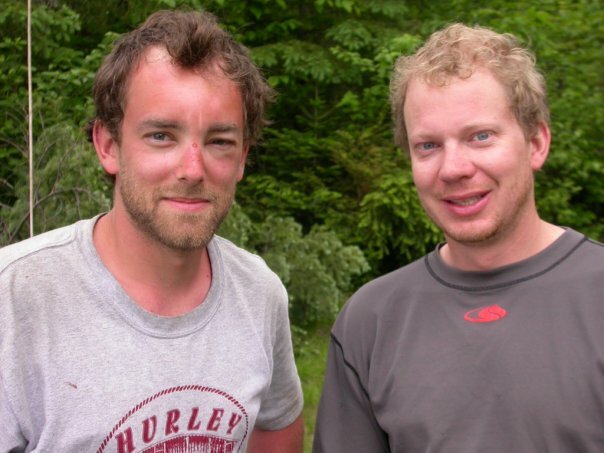 Will and Chris travelled an average of 14 hours a day under grueling conditions, sun stroke and a bit of foot rot but their determination overcame and the link was completed in 9 days. The time set is a record that will be hard to beat. They said that should their record ever be beaten they would do the trip again, but in old tripping fashion. 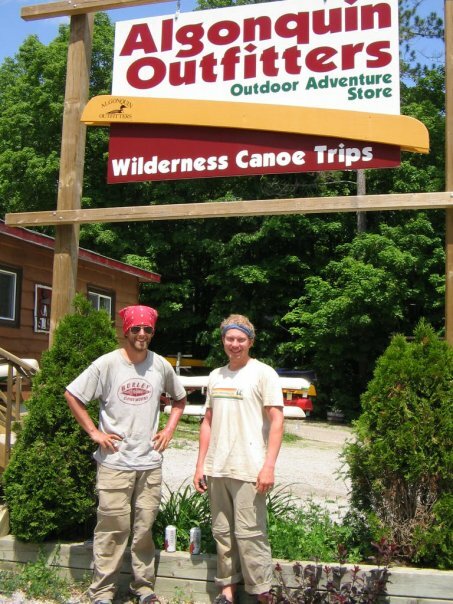 With cedar canvas boats, canvas packs and only gear that was used the year the company was founded, 1961. You can even join the Meanest Link community on Facebook! 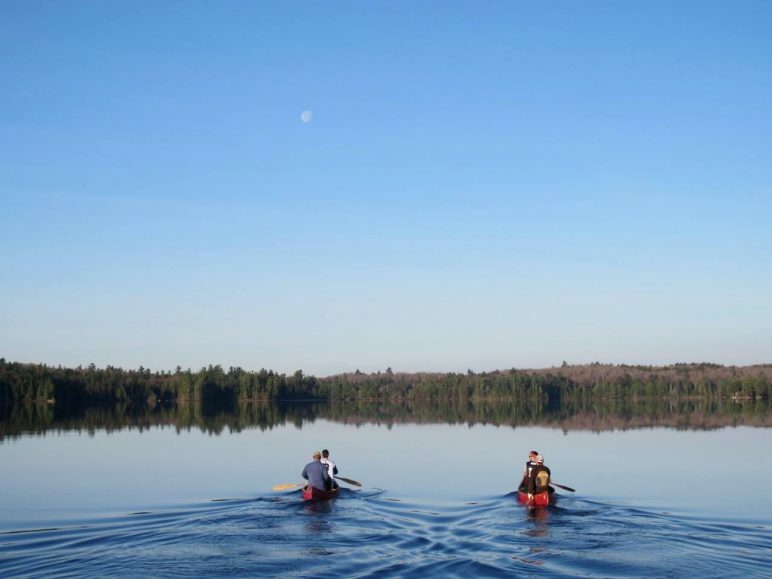 On August 3rd, 2018 Alex and Noah attempted to complete Algonquin Park’s Meanest Link in 9 days, a feat that has never been accomplished with solely canoe paddles. 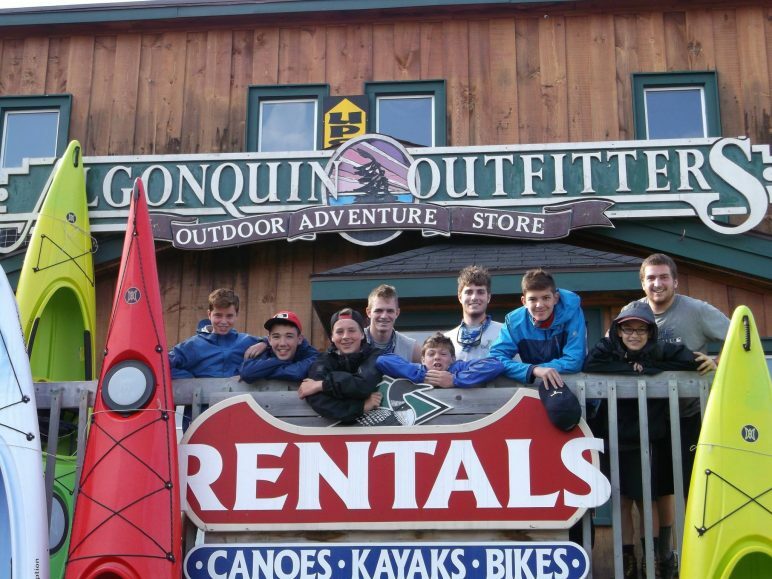 The trip was in support of Project Canoe where the pair hoped to raise $2500 to help create opportunities for adventure in underprivileged youth’s lives. In June of 2013 renown paddler and author, Kevin Callan, better known as The Happy Camper tackled the Meanest Link with his good friend Andy Baxter tackled in their own unique way. Read more on Kevin’s Blog at Explore Magazine. The route outlines below are written for the paddler going in a clockwise direction. In our opinion, going clockwise takes the best advantage of elevation gains and losses but there is no reason you can’t go the other way, particularly on a “one section” trip. Some lake names have been abbreviated to save space. Thanks to Camp Pathfinder for compiling this detailed trip outline. “Linkers” must follow the official route for each section and complete the section in a single trip. One exception is the Huntsville to Brent leg, which could be done in two parts: Huntsville – Rain Lake, then Rain L. – Brent. See the complete route outline above. you can go either direction. you can do a section at a time, two or three sections or attempt the whole loop. If you attempt the Full Link but do not complete it, your completed section(s) will be recorded on the Meanest Link Wall of Fame. no solo trips (for safety). take pictures of the portage signs (at the very least) to prove you did it. you have to use the same self-propelled watercraft for the whole section, or for the whole Link if you are doing the continuous loop. Paddlers using anything but a canoe will be scoffed at. you can travel as fast or as slowly as you like. It is not a race. safety is of paramount importance. Travel carefully! when paddling the Brent to Opeongo leg, the party must stop at (preferably camp at) Meanest’s favourite site on Lake Lavieille. each trip member has to drink a particular refreshing beverage on that particular site. For more information on rules 9 and 10, please contact the Meanest Link Advisory Board at Oxtongue Lake. 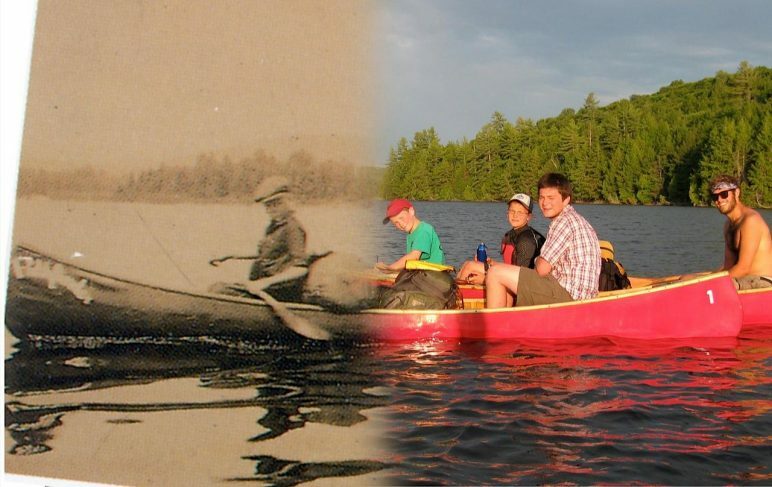 when paddling the Opeongo to Oxtongue Lake section, you must go up the Little Madawaska to Source Lake and stop at Camp Pathfinder, in order to pay your respects to the place where it all began for Meanest in Algonquin Park.